The Peace Project is visiting Port Elizabeth for the first time. 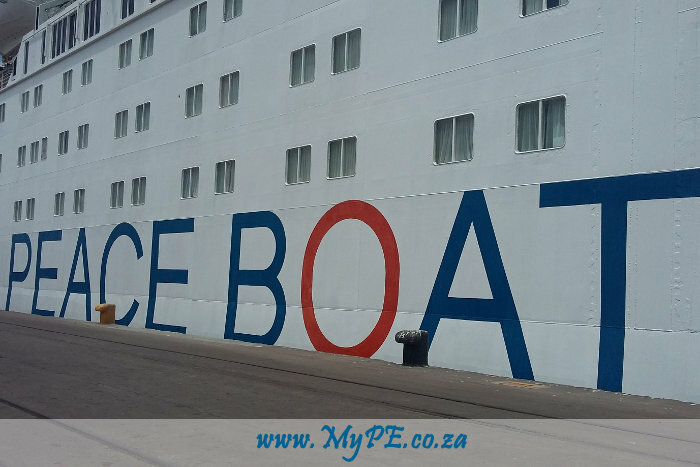 The Transnet National Ports Authority (TNPA) today welcomed the Ocean Dream passenger liner, which docked in the Port of Port Elizabeth this morning. “This is a significant occasion as it does not only mark the 100th Peace Boat global voyage for peace and Peace Boat’s 35th anniversary, but her visit is also symbolic to Nelson Mandela Bay – named after South Africa’s Nobel Peace Prize winner, president Nelson Mandela. The Port of PE shares Peace Boat’s aspirations of fostering peace, human rights, environmental protection and sustainable development. The vessel’s 3-day port visit will allow the crew and passengers more time on our shores, supporting the potential establishment of a dedicated cruise liner terminal in the Port of PE,” said Rajesh Dana, Port Manager, Transnet National Ports Authority. The ship was welcomed by a water ballet and traditional dancers, followed by an intimate ceremony on board where the vessel was officially welcomed to the city by its Deputy Mayor, Cllr. Thsonono Buyeye and the Port Manager, Rajesh Dana. Captain Viktor Alymov (captain of the Ocean Dream) exchanged plaques with TNPA Pilot, Andrew Ker Fox and courteously took the guests on a guided tour through the ship, which has a draft of 7,5 m, a length of 205 m and a gross tonnage of 35,265 tons. Peace Boat is a global non-government organisation headquartered in Japan. It was established to raise awareness and build connections internationally among groups that work for peace, human rights, environmental protection and sustainable development. It carries out its main activities through a chartered passenger liner that travels the world on peace voyages. Three global voyages and one short Asian regional voyage are usually organised each year. The 3-month global voyages are joined by around 800 international passengers who visit between 15 and 20 countries. They travel particularly to areas that are experiencing or have experienced unrest. The ship, as a neutral space beyond borders, becomes a floating peace village, encouraging a sense of community, enabling direct dialogue between those on board and in the ports visited. Although it may look like a regular cruise liner from the outside, a Peace Boat voyage is very different from the traditional model – replacing vacation with participation and adapting the on-board spaces to provide a unique and dynamic environment for its participants. It does not carry “passengers” in the traditional sense. Everyone on board is an active “participant” in a Peace Boat project. A Peace Boat voyage is a life-changing experience, harnessing the talent of staff and participants alike to create an environment where people can live and learn together, while undertaking socially responsible travel to some of the most fascinating regions on earth. Most participants are from Japan, but many are from China, Singapore and Korea. The ship is operated and staffed by over 250 professional officers and crew. Peace Boat’s staff members represent a wide variety of ages, educational backgrounds and nationalities. Nearly all of them joined the Peace Boat team after participating in voyages as volunteers, demonstrating commitment to Peace Boat’s activities. During each voyage Peace Boat organises a range of educational activities, including conferences by guest educators, workshops, lectures, language classes and cultural programmes. The themes of these activities link Peace Boat’s fields of work with contemporary issues in the countries they visit, connecting participants with people around the world. These are supplemented by a wide variety of events planned and run by participants, who are encouraged to actively share their interests, talents and life experiences. Peace Boat also arranges exchanges and study tours with their NGO partners and local community groups in the ports they visit. These optional programmes seek to foster international peace and friendship at grassroots level. They also provide humanitarian aid at various stops and tourism-oriented tours. Peace Boat was founded in 1983 when its first voyage was organised by a group of Japanese university students as a creative response to government censorship regarding Japan’s past military aggression in the Asia-Pacific. They chartered a ship to visit neighbouring countries with the aim of learning first-hand about the war from those who experienced it and initiating people-to-people exchange. Among the projects that Peace Boat initiated include the Landmine Abolition Campaign in Cambodia and Afghanistan, the Peace Ball Project – donating 12 000 soccer balls to disadvantaged children in 43 countries, the GET Language Programme, the Global University Programme, the Global Partnership for the Prevention of Armed Conflict project, the Vietnam Defoliate Victim Support Campaign, the Peace Boat Millennium Development Goals Campaign, the Ocean and Climate Youth Ambassador Programme and the International Campaign to Abolish Nuclear Weapons (ICAN). The Nobel Peace Prize was awarded to the ICAN project in 2017. They established the Peace Boat Disaster Relief Volunteer Centre following the devastation caused by the 2011 Great East Japan earthquake and tsunami. Peace Boat’s activities are based on the philosophy that any problem faced by any community is a global challenge that must be tackled through cooperation between people, organisations and governments of the world. Peace Boat funds itself through individuals paying the costs to join their voyages. They believe that the mobilisation of volunteers is one of the key elements in building a broad social movement. They make their peace voyages accessible to people from all walks of life. Peace Boat is not affiliated to any political party or religious movement. On 26 December 2018 the Ocean Dream departed from the Port of Yokohama in Japan, starting its 100th Peace Boat global voyage for peace. This voyage of almost 100 days, covers a southern hemisphere route, docking in 19 ports around Asia, Africa and South America. It will return to Japan on 31 March 2019, after visiting 13 countries.